Our girls games are FREE. You need to install flash to play those games. 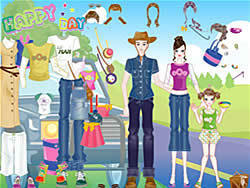 We add new games almost daily so come back often to check out the new dress up games and cooking games! This family needs to dress up first before they go out on vacation. Can you help them? Have fun! Doll Mania project provide you best girls games, baby games, dress up games, cooking games, princess games, little pony games and android games for girls!